Snow that has built up on a roof will start to melt as a result of either exposure to the sun, or from heat rising from the building below. 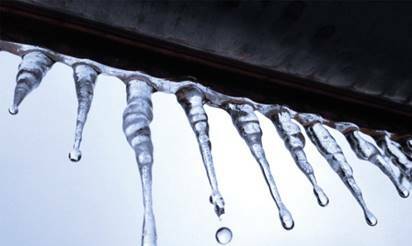 As the melted snow runs from the roof into cold gutters and drainpipes, it can re-freeze forming layers of ice which can continue to build up until the flow is blocked. This can result in damaged drains and gutters. Water can, in addition, get into the roof and building, leading to expensive structural damage such as broken roof tiles, damaged plaster and facades. The HTUK system features a self-regulating heating cable specially developed to prevent ice formation on most types of roof and gutter. As the heating cable is self-regulating, the heat output regulates to ambient conditions at each point of the cable. It can never overheat or burn out – even when overlapped on itself. In snow and icy water, the cable operates at full power. As the snow melts and the water drains away, the cable self-regulates to half power while it dries. As it gets warmer, so the cable gradually reduces its output. A) In snow and ice water, the cable operates at full power. B) As the snow begins to melt and the water drains away, the heating cable self-regulates to half power while it dries. C) As it gets warmer the heating cable reduces its power output.